The attacks keep coming. Murder or maiming by Muslims living among us is an almost daily occurrence in the West. 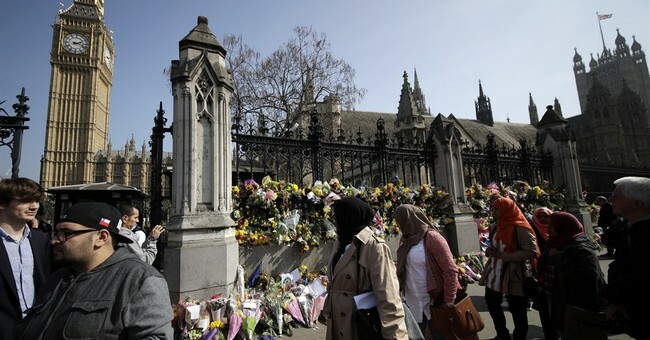 The latest was knifeman Khalid Masood, who plowed a car into pedestrians on Westminster Bridge, London, and then proceeded to slash at them with a 12-inch blade. Immoral media counted five dead, with the killer. In addition to the four murdered, 50 people were injured. Promptly did Prime Minister Theresa May get her Churchill on: "[W]e are not afraid and our resolve will never waver in the face of terrorism." How easy it is to wax fat from the safety of a bunker! May was whisked away from the Houses of Parliament by an armed security detail. In fact, the only reason Masood hadn't claimed more lives for his vampiric God (a peaceful entity, promised Prime Minister May) was because he committed Jihad at the Parliamentary estate. There, a "close protection officer," essentially a bodyguard to a politician, drew a gun and dispatched the rampaging Muslim. So you know: In Cool Britannia, the moniker the Island acquired in the times of trendy Tony Blair, the only way disarmed Britons may shoot a savage is with ... a camera. For in the country that gave us the "Rights of Englishmen," the inspiration for the American founders—including the 1689 English Bill of Rights which entails the right to possess arms—the natural order has been inverted. In the new old Blighty, only criminals are armed. In case you don’t know, the category of "criminal" (according to incontrovertibly correct libertarian political theory) entails the outlaw criminal class—it needs no introduction—and the legalized criminal class: the politicians. In Britain, politicians enjoy the protection of armed security, financed by their subjects. Thus was poor Police Constable Keith Palmer, 48, likely unarmed when he was butchered by Khalid Masood. PC Palmer didn't have a chance. The story of Khalid Masood is certainly festooned with the kind of studied failures you find in the tale of American homeboy Omar Mateen, who murdered 49 gay club-goers in Orlando, Florida, wounding 53 others. Mateen might have been a latent homosexual, but he was loud and proud about his orientation as an aspiring Muslim terrorist. For his part, Masood was a violent criminal with many faces, in-and-out of the Islamized British prison system for inflicting "grievous bodily harm" on his countrymen. At every turn, Masood's life of crime was met with soft responses. He slashes the face of a café owner in the village of Sussex but receives only two years in jail. A similar, but more severe offense nets Masood, then Adrien Elms, a brief jail sentence for "the possession of an offensive weapon." So it was that Masood journeys from Sussex to Saudi Arabia, like any ordinary English lad would. (Is this now a rite of passage in Britain? BBC News’ correspondent Dominic Casciani seems to think so.) There, he can be found hard at work at the General Authority of Civil Aviation. (Yeah, right!) Then it's back to East Sussex. With a nicely fattened, fraudulent CV, Masood goes to work for Aaron Chemicals, in Bodiam, a company which, as it appears, hired him despite his criminal record and predisposition to violence. Speaking of corporate culture, how dangerously politically correct is it? How likely are corporations to put virtue-signaling and politically correct piety ahead of public and worker safety? You be the judge: British security firm G4S employed Omar Mateen, who was out of the closet about his Jihadi sympathies and aspirations. The Swiss security firm Securitas employed Dahir Adan, the Somali, Minnesota mall stabber. Out of all their St. Cloud applicants, Adan seemed like the best bet. Back in the day, Masood, it had been observed, expressed his racial animus toward his Sussex victim while carving up the man's face. Can you imagine an Englishman, an Anglo-American or a European—known to have committed a crime with racial overtones—going on to enjoy a reasonable reputation and as many career opportunities as did the no-good Masood? A British Muslim leads a life of violent crime, rekindles his Islamic faith in prison, no less, then travels to Saudi Arabia, and is welcomed back not to surveillance but to gainful employment. Masood is subsequently questioned but dismissed by the vaunted spies of MI5 as inconsequential: this pervasive pattern tells you all you need to know about The West.